Although hundreds of young women were incarcerated at the House of Refuge for Women in Hudson, New York from 1887 until its closure in 1904, we know of only two complete case files from the period. These rare folders contain the institution’s educational, social, and medical records on a particular resident. A friend of the Prison Public Memory Project shared with us one of these case files, the Lillie Patch case file, only last year. Our friend received the file from Tom Davies, a former social worker at Brookwood Secure Center who held onto the folder for over 30 years. The thick folder tells one girl’s story in unusual depth, revealing a rich and complicated history. In 1975, the New York State Training School for Girls in Hudson permanently closed it doors. The storage areas were cleaned out to make room for the new Hudson Correctional Facility, a medium security state prison that would house adult males. In a storage unit in the basement of the infirmary, along with GI rations from World War II, was discovered the Lillie Patch case file, an unusually complete document from 80 years prior when the buildings belonged to the New York House of Refuge for Women. A social worker specializing in juvenile delinquency, Davies recognized the file as a rare window into earlier juvenile reform practices. Moreover, Brookwood’s connection to the Hudson facility intensified Davies’ interest in finding out what happened on the grounds all those years before. Brookwood Secure Center, opened in 1964, is a juvenile male correctional facility in Claverack, New York, just southeast of Hudson. The buildings that housed Brookwood were originally built as an annex of the Training School For Girls containing farmland for vocational programming and its disciplinary building, out of the way from the main institution in Hudson. Davies was immediately struck by the case file’s details on the criminal and juvenile justice system at the turn of the twentieth century. The file comprises a wide variety of document types, including commitment records, behavioral reports, letters, photo portraits, and an application for transfer to the State Custodial Asylum for Feeble-Minded Women. By sorting through these different primary sources we may form an idea of one girl’s experience at the House of Refuge for Women, and how this individual experience reflects broader social trends of the time. Opened in 1887, the House of Refuge for Women was the third reformatory for women in the United States and, at the time, the only state prison for women in New York. The project was pioneered by Josephine Shaw Lowell, a progressive reformer who believed that gender-separated, specialized housing was critical to the reform of female delinquents. Lowell maintained that vice could be trained out of vagrant women between the ages of 15 and 30, and advocated a rural cottage living system so that they might be made virtuous by living in a pastoral, family-like environment. However, records and journalism of the day suggest that although the House of Refuge aimed to serve as a safe house, its disciplinary and social practices often resembled those of a prison. Excessive physical punishment provoked a major riot in 1899. An investigation disclosed not only harsh punishment but also complete mismanagement. A new administration closed the dungeon and revised the merit plan but within a year their reports mention punishment cells again. Newspaper articles from the period also reveal this more disciplinary side of the Refuge’s methods. The local Hudson, NY blog Gossips of Rivertown has detailed some of these newspaper articles reporting on the cases of particular women who were wrongfully imprisoned and faced harsh treatment during their imprisonment. However, other details sprinkled throughout the case file suggest that Lillie could read. Her intake form indicates that she writes to her mother, and a later document notes that she amuses herself “by knitting and reading.” The reason for the disconnect between these facts is unclear. Nonetheless, the varied historical clues in Lillie’s case file emphasize the dominant attitudes towards delinquent young women. This firsthand documentation is a reason Davies recognized the importance of the file and held onto it. In principle, the House of Refuge shared more features with a safe house or reformatory school than a typical prison. Josephine Shaw Lowell believed that vice in young people was the result of an impoverished environment, and that the best way to reform delinquency was to remove them from that environment. One special aspect of the Lillie Patch case file is that it includes correspondence between the House of Refuge for Women and other reform-based organizations from the period, providing insight into the multifaceted effort to address the problem of impoverished children. The file includes an 1899 letter addressed to Superintendent Sarah E. Henry from the Saratoga Society for the Prevention of Cruelty to Children, which advocated for several Saratoga girls who were kept at the House of Refuge. It is unclear whether the House of Refuge authorities aided Lillie’s sister in her search, or whether the sisters were able to get in contact. 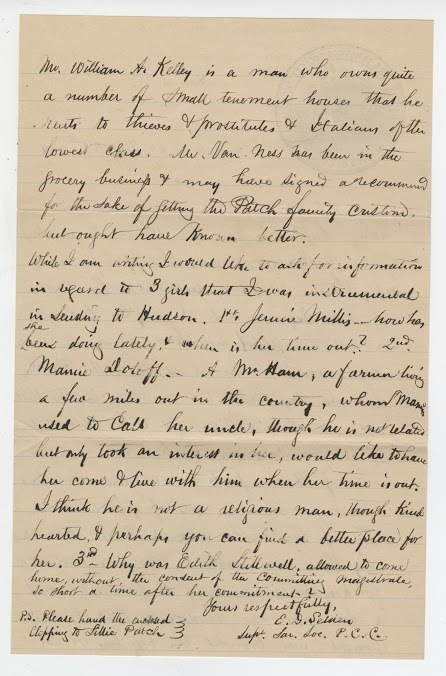 The facility’s right to control the young women’s mail was likely in practice in this case, and the correspondence also demonstrates the limited contact that incarcerated girls had with the outside world, including their own families. 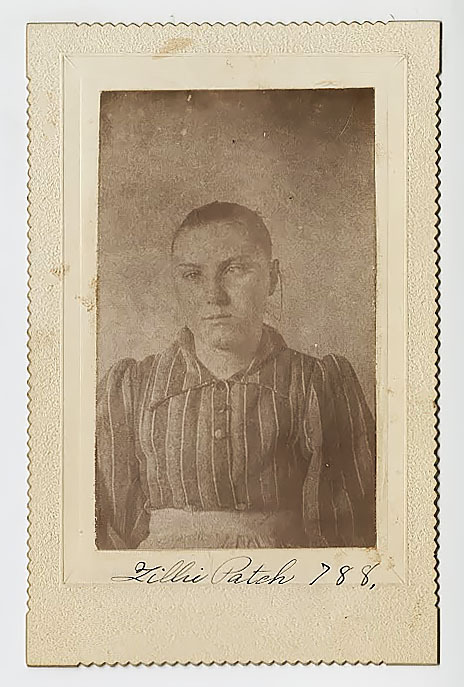 A likely reason for Lillie’s uncertain whereabouts is that beginning in August 1900, the House of Refuge for Women applied for Lillie’s transfer to the State Custodial Asylum for Feeble-Minded Women in Newark, New York. Established in 1878, the Asylum was also a project of Josephine Shaw Lowell and housed women who were considered promiscuous. She established this institution with the assistance of the State Board of Charities, advocating for the Asylum before the state legislature by arguing that “feeble-minded women often disregarded moral and sexual restraint when placed in the undisciplined environment of an almshouse and frequently had illegitimate children who, in turn, became dependent on the state for their welfare,” and that placement in a specialized institution “prevent them from multiplying their kind.” Documents in Lillie’s file from the State Custodial Asylum include the application, notification of Lillie’s place on the waiting list, and final approval of her transfer. As her record at the House of Refuge ends in January of 1901, it can be assumed that Lillie was successfully transferred to the Asylum. The application in particular reflects prevailing beliefs about delinquency and female sexuality at the turn of the twentieth century. The girl is feeble-minded. The only history I can obtain is by questioning the girl herself and her statements cannot be relied upon. Besides this wide swath of institutional records and correspondence, the greatest insight into Lillie’s day-to-day life at the House of Refuge for Women is found in her “Record and Report”, which documents her behavior every week from February 1898 to January 1901. In each entry, Lillie is given a score out of 10 for nine different factors, including personal cleanliness, profanity, and honesty. These scores are then translated into a weekly mean, which must average out to at least an 8.7 in order to constitute progress towards completing her five-year sentence. Most weeks, only Lillie’s average is noted, usually a full 10. This name has been changed to protect the individual’s privacy. Fox Butterfield, "All God's Children: the Bosket family and the American tradition of violence," (New York: Knopf, 1995), 184. Thomas Stearns, “Early State Schools of New York,” from Museum of Disability History, 16 November 2011, Web, http://museumofdisability.org/early-state-schools-of-new-york/. Emma Friedlander is an intern with the Prison Public Memory Project in Hudson, NY focusing on research, story development, community engagement and outreach. She is a rising senior at Grinnell College, where she studies History and Russian. Her work experience includes internships at Macmillan Publishers and the Museum at Eldridge Street in New York City. Emma is also the editor-in-chief of the Grinnell College student newspaper, the Scarlet & Black.